A few weeks ago, during SUSE Hack Week 10 and the Berlin Qt Dev Days 2013, I started to look for Qt-based libraries, set myself the goal of creating one place to collect all Qt-based libraries, and made some good progress. We had come up with this idea when a couple of KDE people came together in the Swiss mountains for some intensive hacking, and where the idea of Inqlude, the Qt library archive was born. We were thinking of something like CPAN for Qt back then. Since then there was a little bit of progress here and there, but my goal for the Hack Week was to complete the data to cover all relevant Qt-based libraries out there. The mission is accomplished so far. Thanks to the help of lots of people who contributed pointers, meta data, feedback, and help, we have a pretty comprehensive list of Qt libraries now. Some nuts and bolts are still missing in the infrastructure, which are required to put everything on the web site, and I'm sure we'll discover some hidden gems of Qt libraries later, but what is there is useful and up to date. If some pieces are not yet, contributions are more than welcome. Many thanks as well to the people at the Qt Dev Days, who gave me the opportunity to present the project to the awesome audience of the Qt user and developer community. 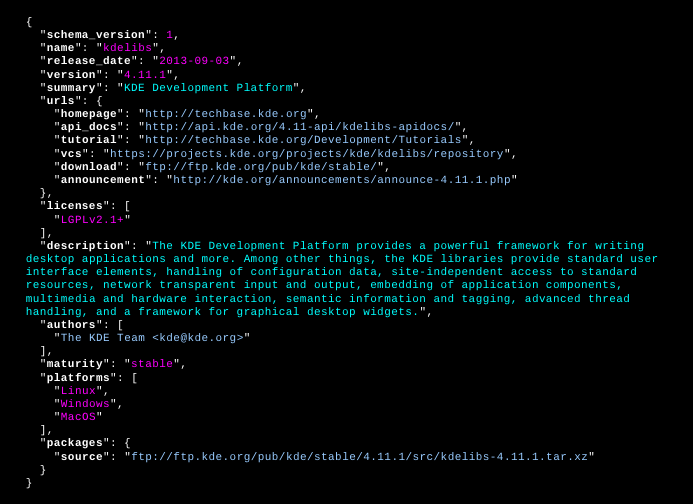 The first key component of the project is the format for describing a Qt-based library. It's a JSON format, which is quite straightforward. That makes it easy to be handled programmatically by tools and other software, but is also still quite friendly to the human eye and a text editor. The schema describes the meta data of a library and its releases, like name, description, release date and version, links to documentation and packages, etc. The data for Inqlude is centrally collected in a git repository using this schema, and the tools and the web site make use of it to provide nice and easy access to users. The second key component is the tooling around the format. The big advantage of having a structured format to describe the data is that it makes it easy to write tools to deal with the data. We have a command line client, which currently is mostly used to validate and process the data, for example for generation of the web site, but is also meant to help users with installing and downloading libraries. It's not meant to replace a native package manager, but integrate with whatever your platform provides. This area needs some more work, though. In the future it would be nice to have some more tools. I would like to see a graphical client for managing libraries, and integration with IDEs, such as Qt Creator or KDevelop would also be awesome. The third key component is the web site. This is the central place for users to find and browse libraries, to read about details, and to have all links to what you need to use them in one place. The web site currently is a simple static site with all its HTML and CSS generated from the meta data by the inqlude command line tool. Contributing data is still quite easy by providing patches to the data in the git repository. With GitHub's web interface you can even do that just using your web browser. There are a few things worth pointing out explicitly as I got similar questions about these from various people. 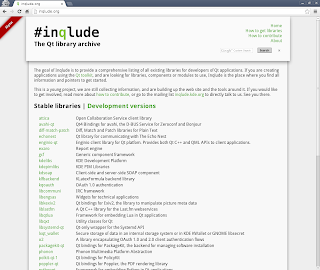 The first thing is that Inqlude is meant to be a collection of pointers to releases, web sites, documentation, packages. 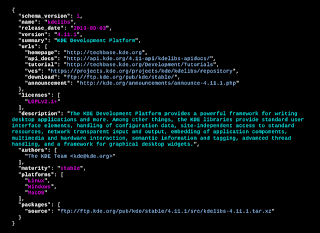 It's not meant to host the actual code, tar balls, or any other content belonging to the libraries. There are plenty of ways how to do that in a better way, and all the projects out there already have something. Inqlude is just meant to be the central hub, where to find them all. Another thing which came up from time to time is the question of dependencies. We don't want to implement yet another package management system, or another dependency resolver. So there we rely on integration with the native tools and mechanisms of the platforms, we run on. Still it would be nice to express dependencies in the meta data somehow, so that you have an easy way to judge, what you will need to run a given library. We will need to find a way how to do that in the best way, maybe a tier concept, like KDE Frameworks 5 is using it, would do the trick. 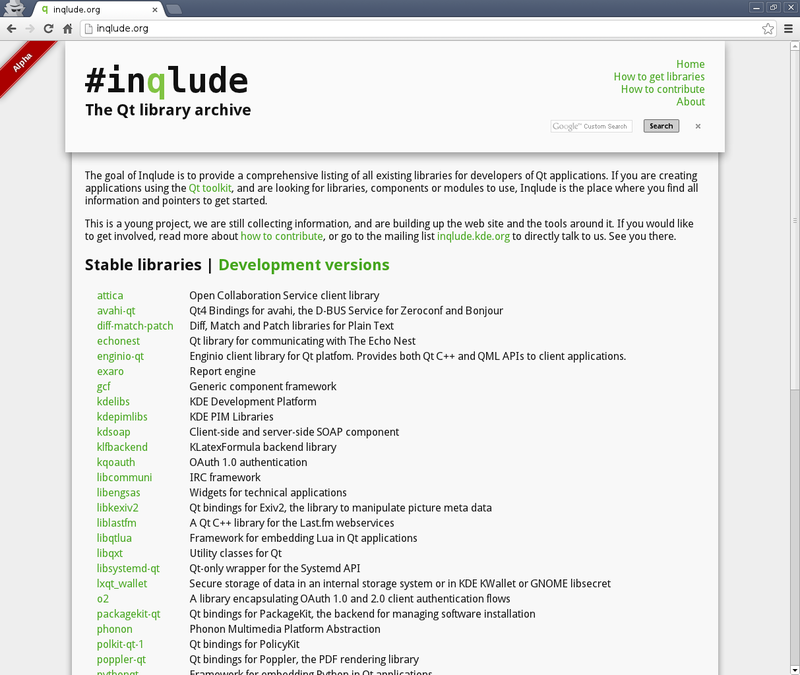 Finally I would like to stress that Inqlude is open to proprietary libraries as well. The infrastructure and the tooling is all free software, but Inqlude is meant as an open project to collect all libraries which are valuable for users on the same terms. The license is part of the meta data, so it's transparent to users, under which terms the library can be used, and this also allows to categorize libraries on the web site according to these terms. There still is a little bit of work missing to do that in a nice way, but that will be done soon. Free software libraries of course do have the advantage, that all information, code, and packages, is directly available, and can be accessed immediately. Collect and accurately present generic information about libraries, which is not tied to a release. This is particularly relevant for providing a place for libraries, which are under development and haven't seen a formal release yet. As said above, the listing of proprietary libraries needs some work to categorize the data according to the license. Then we can display libraries of all licenses nicely on the web site. Currently we have one big entry for the Qt base libraries. It would be nice to split this up and list the main modules of Qt separately, so it's easier to get an overview of their functionality, and use them in a modular way. Integration with Qt Designer, so that available libraries can be listed from within the IDE, and being used in your own development without having to deal with external tools, separate downloads or stuff like that. Build packages in the Open Build Service, so that ready-to-use binary packages are available for all the major Linux distributions. This possibly could be automated, so that ideally putting up the meta data on Inqlude would be all what it takes to generate native packages for openSUSE, Fedora, Ubuntu, etc. Integration with distributions, so that libraries can be installed from inqlude via the native package management systems. This already works for openSUSE provided the meta data is there, but it would be nice to expand this support to other systems as well. Upstream the meta data, so that it can be maintained where it's most natural. To keep the data up to date it would be best, if the upstream developers maintain it at the same place and in the same way as they also maintain the library itself. This needs a little bit of thought and tooling to make it convenient and practical, and it's probably something we only want to do when the format has settled down and is stable enough to not change frequently anymore. There might be more things you would like to see to happen in Inqlude. I'm always happy about feedback, so let me know. This was and is a fun side project for me. It's amazing what you can achieve with the help of the community and by putting together mostly existing bits and pieces. Creating software since 1982 and still loving it.